On October 13th, Mike, John Paul, and I celebrated the one year anniversary of first finding out I was in remission by participating in the Capital’s “Light the Night Walk” to create awareness for blood cancers and raise money for the Leukemia & Lymphoma Society. There was certainly something beautiful about seeing my white survivor balloon glowing brightly among the red supporter balloons of my family and friends. And yet, I felt less triumphant and jubilant than I expected. Instead, I was overwhelmed by sadness, realizing how deeply cancer has changed me, and that the further I am from finishing treatment, the further I have to go to be truly healed. In a sense, I have accepted that cancer has changed me beyond my short hair and scars. And beyond acceptance, I am actually thankful for some of what it has taught me – even if the education was rough and raw. There is no doubt that I have learned firsthand how incredibly important my family and friends are to my very survival, and how deeply I feel that what truly matters are the relationships we cultivate with others. And while it may have also caused a painful loss of innocence, facing death and subsequently immersing myself in the cancer world has shown me firsthand how short life on this earth can be, and how tragic it is to spend any of our time blind to the beauty that surrounds us. And yet, I often wonder if learning these lessons means anything at all. For it seems that what I know in my head has yet to positively affect what I feel in my heart, which is mostly pain and resentment. Though I have always been sensitive, I now routinely find myself crying because of tragedy I hear about on the news. Though I have always felt grateful for the blessings in my life, I now frequently forget them altogether and let myself fall into a deep depression, obsessing about how unfair it is that I have to continue to worry about PET scans, possible infertility, nerve damage in my chest, and reoccurrence. The most cherished compliments I used to receive were when others told me my positivity cheered or inspired them, but now, I regard the positive, cheerful person I used to be as a stranger. What’s worse, while I yearned to be surrounded by loved ones and hungered for connection when I was sick, over the past few months I’ve slowly retreated into my own anxiety and frustration. Rather than living with purpose and seeking connection like I so long to, I live as a leaf hangs from a tree, blending in with my surroundings, waiting for the wind to blow hard enough to move me, rather than venturing forward on my own. Mike and I recently took a trip to France, which was as beautiful and incredible as you would imagine such a trip to be. And there are many things that came easily on our trip that I’ve struggled with lately. 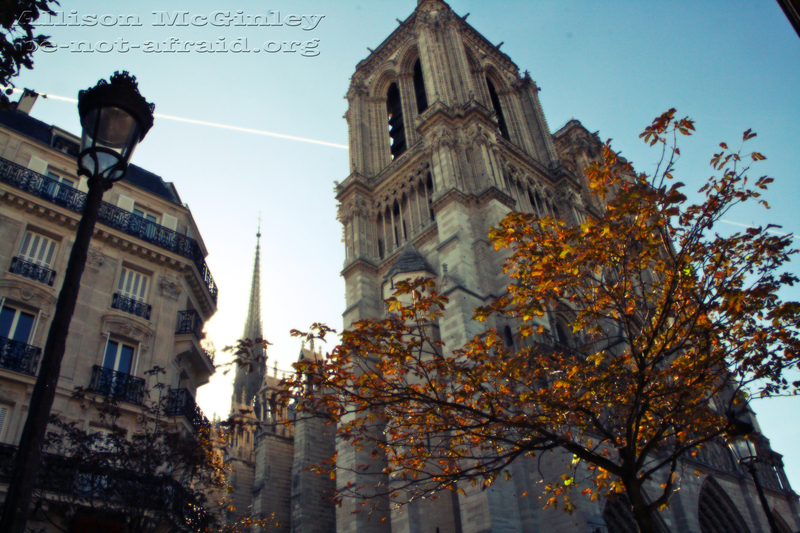 After all, it’s not hard to feel rested when you let sunlight peeking through the window wake you, content when you have nothing to do but wander the charming streets of Paris, or inspired when you gaze upon the detailed wonder of the Notre Dame cathedral. But being in a foreign country where you know no one other than your travel companion and know little more than pleasantries in the native language can also make it easy to blend in with the background. In my case, it aided my ability to disengage and retreat even further into myself, my problems, and my feelings. And while this is often exactly the welcome reprieve one might want or even need in their overly connected life, for someone who has perfected the art of feigned connection (via pictures shared on Facebook or short texts here and there), it can be dangerous. 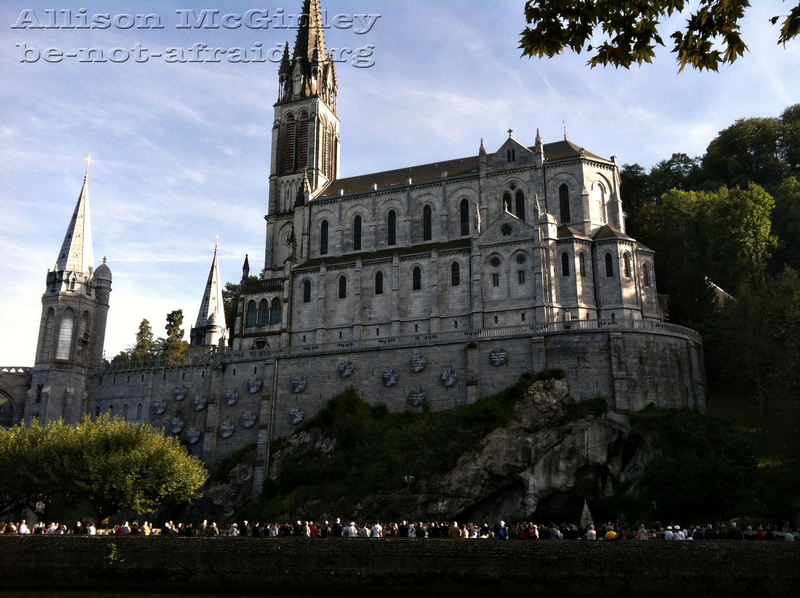 Yet after a few days filled with enjoyable, indulgent activities, Mike and I traveled somewhere that couldn’t have been more different from the city of lights – the pilgrim destination of Lourdes. 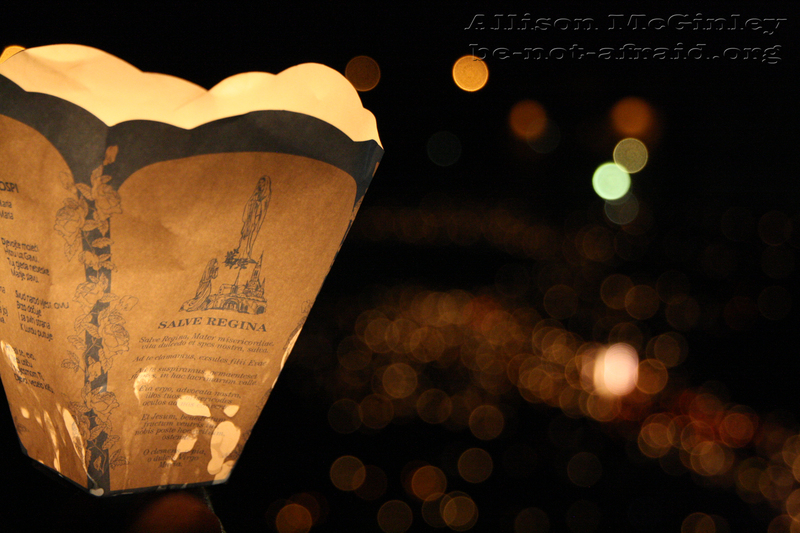 Though the streets of Lourdes are filled with kitschy religious souvenirs and neon signs, once you enter the grounds of the Grotto, everything is different. On these grounds in 1858 the Virgin Mary appeared to a young girl, Bernadette, on eighteen different occasions. She strengthened Bernadette’s faith and offered words of wisdom, all while providing her with glimpses of the peace she would eventually – and only – find in heaven. During one of Mary’s Apparitions, she directed Bernadette to dig into the ground and drink and wash herself from the water found there. Ever since, pilgrims have come to visit this holy place. Many come to drink of the water that still flows from the spring, hoping that in doing so Mary will aid them in strengthening their faith and prayer life. And among the faithful who have come to pray and drink and bathe in the water, there have been sixty-seven unexplained cures, all confirmed as miracles by the Church. Even with hundreds of pilgrims milling about, speaking French and a myriad of other languages in hushed voices, the sacredness of the place was palpable, and at first glimpse of the Grotto I began to weep. The emotion of being in a place I’d dreamed of visiting for so long knocked every bit of thought or anxiety out of me, and for at least a moment, I was completely engaged and felt wholly connected to all those praying in similar reverence around me. Later that evening, Mike and I joined other pilgrims at the Marian procession. 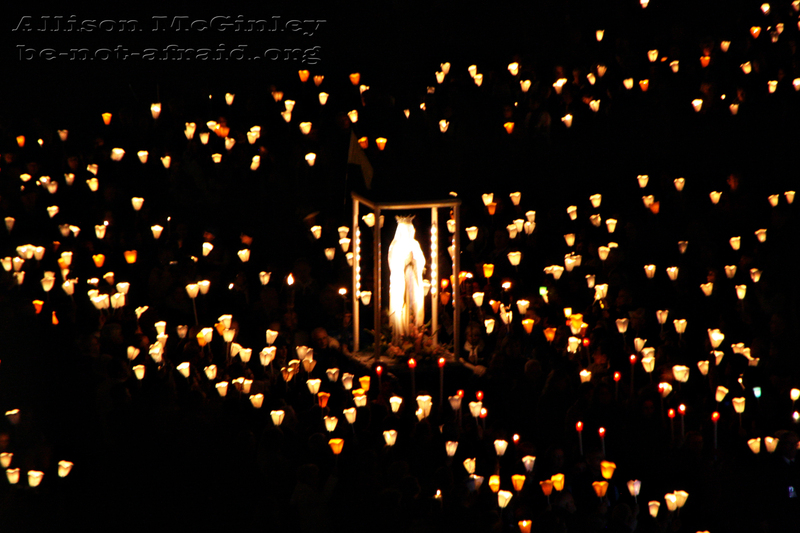 Together, holding candles in the moonlight, we prayed the rosary, each decade said in a different language. The eldest and sickest among us led the procession to the altar. I sang the words of the Salve Regina acutely aware that although I was considered one of the healthy, strong ones present, my soul was as broken and weak as the body of the sickest pilgrim. Among so many people being completely vulnerable about their physical ailments, I could no longer hide from the ailments of my soul. As I cried freely, strangers on either side of me, my brokenness and pain were out in the open. I felt more vulnerable than I ever had when I had ashen skin, no eyebrows, and only wisps of hair on my head. Exhausted from the emotion of the procession, Mike and I headed back to our hotel room afterwards, ready to lie down and rest. But before we’d even removed our shoes, Mike received an email from a friend, who is ill and in need of prayers. Almost wordlessly we got up, put our coats back on, and headed out into the night. 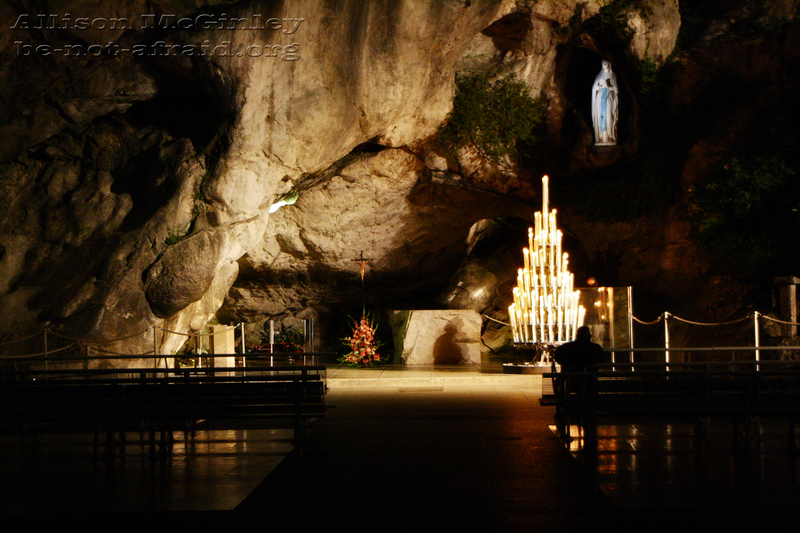 It was nearly midnight when we made it back to the Grotto, and the still silence and emptiness of a place that had once been buzzing with life was jarring. But despite the black sky and frigid air, there was a warmth not present during the day. Mike and I entered the Grotto for the first time, with no line or crowd to navigate. After lighting a candle for our friend, Mike returned to the pews to pray. Though I began to follow, I felt drawn deeper inside, to the wall where water trickled down. After rubbing my hands in it, I kneeled down on the cool, damp ground. As I sat there begging God to heal our friend, I knew that selfishly, my tears were as much for myself as for her, and that when I said over and over “heal her – please God heal her,” though my prayer for her was entirely genuine, I was also begging for the healing of my emotional pain. But no sudden miracle occurred in my heart that night. Though I could see the beauty in front of me, I still couldn’t truly feel it. Though I could sense the holiness of the place, I couldn’t truly see it. Numb and blind, I got up and reentered the darkness. That night, Mike and I slept for hours. We finally awoke in the early afternoon to the sounds of mass being said at the grotto, ringing bells and muffled voices creeping into our room. Though we had slept longer than either of us had in months, maybe even years, I still felt groggy. I showered and dressed in a daze. It was our last afternoon in Lourdes and I knew there was only one thing left to do – only one more thing I could think of to try to heal my broken heart. I needed to do more than drink from the fountain of water; I wanted to be bathed in it. My hunger for my heart to be healed was overwhelming, incredibly, even stronger than any hunger I’d felt for a cure when I was sick. Mike was able to join the “young men’s line,” and immediately enter the private baths, while I joined a long winding line of women, mostly French and much older than me. I had barely moved five feet when Mike returned, looking fresh and invigorated. We made plans to meet at a nearby cafe once I made it through, and I resumed aimlessly mouthing the French words of the Hail Mary being recited by the pilgrims all around me. The line moved almost excruciatingly slow, but I didn’t mind. In fact, the closer I moved to the baths, the more nervous I became. I was ready to ask God to heal my pain – I needed to ask Him for this. But up until then I hadn’t truly put my desire for healing into words. Though I knew that God undoubtedly already knew the hidden yearning of my heart, how could I go on if I actually said the words out loud, put myself on the line, and still felt no relief? How could I remain faithful? My desire to simply be happy threatened to overcome my faith. Though we hadn’t spoken more than pleasantries to one another when first entering the line, the elderly woman sitting next to me suddenly interrupted my thoughts by grasping my upper arm. I looked at her and she said something I couldn’t understand in French, her brows furrowed in concern. I shook my head,”Je ne parle pas francais. Desole.” She furrowed her brow even deeper and clasped her hands to her chest, right above her heart, in the same place where doctors had found a softball sized cancerous mass in my chest a year and a half earlier. Then she put her hands together as if praying, not taking her eyes off mine. I looked down at my chest, wondering if my pink scar was showing, but it wasn’t. “Merci,” I said, looking away so she couldn’t see the tears in my eyes. Finally, I made it to the bathhouse. Smiling women wearing Berets ushered us inside in groups of three or four. They helped us undress and wrapped us in white sheets. And before I knew what was happening, I was standing before a long curtain. It opened, and two women helped me down the steps toward a long tub filled with water. Before helping me get in, they paused and gestured towards the statue of Mary at the end of the tub, and I knew that this was it – the time to ask for Mary to intercede on my behalf to God for the healing I so desperately needed in my heart. But before I could form the words in my mind, a familiar sharp pain in my chest stopped me. I no longer worry about the sensation, as biopsies have confirmed it is merely scar tissue healing – not cancer growing. Yet, the sharpness of the pain is still shocking, and was enough to interrupt my thoughts even then. Even so, as I entered the tub and sat down, immersing myself completely in the freezing water, I didn’t feel frustration. And instead of begging God to heal my heart as I had planned, I merely lay down, my skin tingling as if burned by the cool water. In that moment, I realized that just like the painful healing of my tumor, the healing of my heart might always be painful. In fact, it might be similarly incomplete on this earth, and in this lifetime. But is that necessarily bad? For, what would life look like if the raw, exposed parts of my heart never closed but remained wide open? Though I might never return to the innocent days of my youth, could it be an opportunity to be something more? Could a heart broken wide open spur me to love more deeply, live more freely, and above all, act more compassionately? And instead of allowing my pain to make me resentful and angry, could I use it to become more compassionate and kind? As I exited the bath house and made my way back towards the Grotto, I looked to my right just as the person walking next to me looked to her left. It was the same woman who’d sat next to me in line. Without thinking, I hugged her. Neither of us moved for a minute or two, then reluctantly pulled away, smiling at one another, no words needed to convey the connection we’d formed that afternoon. A few days later, Mike and I returned home. Despite the joy at being reunited with our son, life was immediately overwhelming. 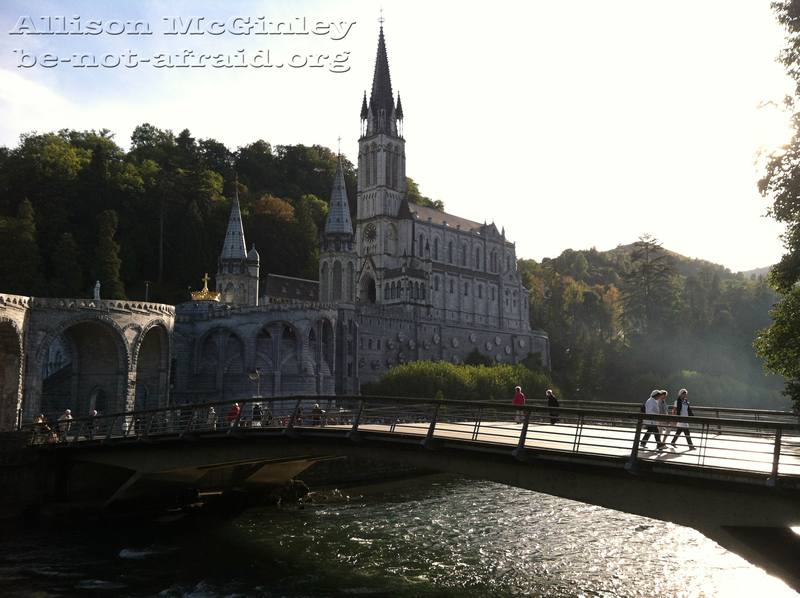 The very things that seemed so clear in Lourdes threatened to disappear in the smoky haze of our everyday life. And yet, just as my cheeks felt warm and raw for days after skiing in the Colorado winter, I can still feel the burn of the cold water of Lourdes on my skin. I pray it never fades, but rather, continuously reminds me that the road towards true happiness must be walked with a heart willing to be broken again and again. For how else can we truly empathize with those in pain around us? How else can we live as Christ, with hands reaching outward in compassion to hold those in need tightly to our chest? I have missed your posts greatly. Healing is bittersweet–in body, in mind, in soul and in heart. But HE is a faithful God, forever. He grows not weary of our progress, however slow it may be. He grows not fearful of our pain, for HE longs for the day when HIS presence in our lives is unhindered. Forgive my very belated response, Debbie. I just wanted to thank you for your beautiful words-I have been mulling on them ever since-knowing them in my head, but trying to know them in my heart. Thank you for all of your support through my healing! Gorgeous post, Allison. I needed to read it and will continue to meditate on it. Thank you so much, Mary Catherine. God bless you too. What a inspiring,real, honest and heartrenching post. I love the beauty yet truth to your posts and appreciate that you express that not everything is easy and perfect in our lives but continue to push forward even with our nature fear in life! Hugs from LA! Muah! Allison–you’ve brought tears to my eyes. I’m so glad Bethany from L’Arche forwarded your post. Thank you for letting us see into your life…you are a witness of a life lived honestly. Thank you so much, Melissa. I’ve always admired you so much and all you do for L’Arche and I believe the very same of you-that you are a witness of a life lived honestly. Thank you! I have missed you so much and have often let worry engulf me. Thank you for sharing again. I wish I had the answer…an answer…for surely there is one. I wish I were eloquent with words and could at least, soothe you. But I can pray, and I do pray for you. I do feel compelled to ask you if you have checked with your doctors to make sure your unrest is not being caused by something biochemical. I know you see more than your share of doctors, but please don’t be afraid to ask for help with this issue as well. Sweet Allison, please feel wrapped in my love and prayers. Oh Marjorie, forgive me for not responding sooner to you sweet words. How kind you are to think of me, and how grateful I am for your support. What an amazing thing the internet is, bringing strangers together!! And I cannot thank you enough for your prayers-that means more than any words could ever mean to me. And thank you for your suggestion-I am working on the biochemical stuff too, which is very important. Thank you for showing me so much love-it means the world to me, and please know of my gratefulness and prayers for you! I can’t even begin to explain how much this post of yours has touched me. You have a way with words that made me, a stranger, feel completely connected to you. I send you love and positive thoughts. Thank you so much for reading and your kind words!! And I am LOVING your blog!!!! 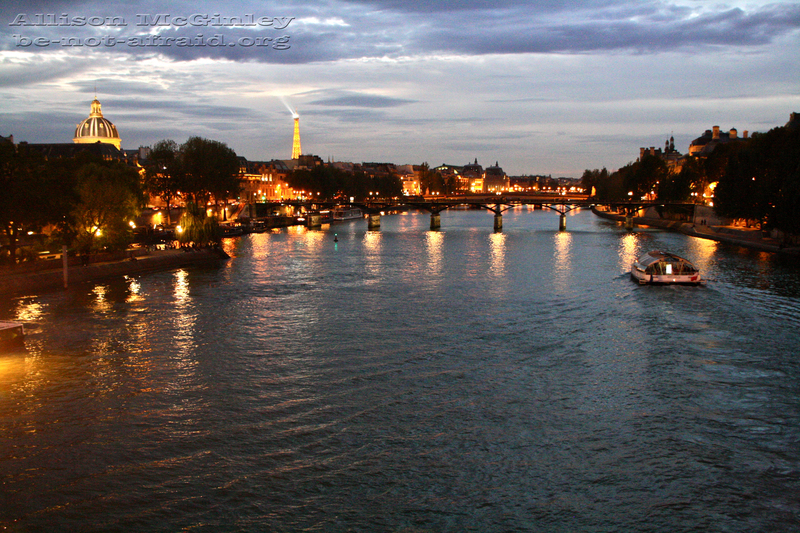 It’s my absolute dream to live in France, so thank you for letting me live vicariously through you!! I read your words as my own…it is both painful and encouraging. I just found your blog posted on the ND Alum group on FB (completely unaware of the content–I know the Lord led me here) and am excited to scour it top to bottom… I too am an ND alum class of ’06. This week marks the two yr anniversary of my cancer diagnosis, stage III choriocarcinoma. I too suffered lung tumors and am facing many of the same uncertainties you face, I too know now the “pain of healing”, the loss of innocence, death of dreams…and I too have a longing to be more, something only possible in suffering. I am so happy to have found you and looking forward to reading more of your road. Tonight I just was so overwhelmed I had to reach out. I have shared bit of my own road on my blog, Ever With Grace. I would love to connect. I lost my words. I don’t know what actually should I have to write to you. Should I console you, should I appreciate for your enormous courage, energy or should I salute you? Great post, it is really a great post. God must be crazy! God will definitely be there to help you. I will pray for you.